Moon Knight hasn't always been the most popular of Marvel superheroes. However, this comic has seen quite a boost in value over the last couple of years. I'll get into my theory of why in a little while, but for now, let's talk about the character. There are a lot of people that say Moon Knight is the Marvel version of DC's Batman. I, for one, disagree. Yeah, there are minor similarities. Batman has is "Batarang" and Moon Knight has his own version of them that are shaped like a crescent moon. They also both have a cape and fight crime. To me, this is where the similarities end. Let's go back to the beginning of the characters. Before he was Batman, Bruce Wayne was a rich kid whose parents were shot and killed. He vowed that he would rid the city of the evil that took his parents' lives. He trains his body and mind to become the crime fighter that we all know today. Before Moon Knight, there was Marc Spector (spelled Mark in this issue). He was many things before he became a superhero. He was a boxer, a marine and he was a mercenary. All of Marc Spector's combat experience came from his upbringing, not from a tragedy in his past. The most obvious difference between the two characters, Moon Knight has super powers, Batman does not. While Batman is considered to possess one of the greatest detective minds of all time, he has no super human abilities. Moon Knight, on the other hand, has powers granted to him by the Egyptian lunar god Khonshu. His strength, endurance, and reflexes are enhanced depending on the phase of the moon. The more full the moon is, the more power he has. Moon Knight does have a sidekick. This sidekick's name is Jean-Paul DuChamp, or Frenchie. His first appearance in Werewolf by Night #32 is brief. He is only shown clearly in one panel. Enough with the comparisons. Let's talk about this comic. When we first see Moon Knight, he is kicking the bejesus out of Jack Russell's alter ego Werewolf by Night. Later, we find out that Marc Spector was hired by The Committee to capture Russell. In the last panel, we see an unconscious Werewolf being dragged away by the man in the white cloak. 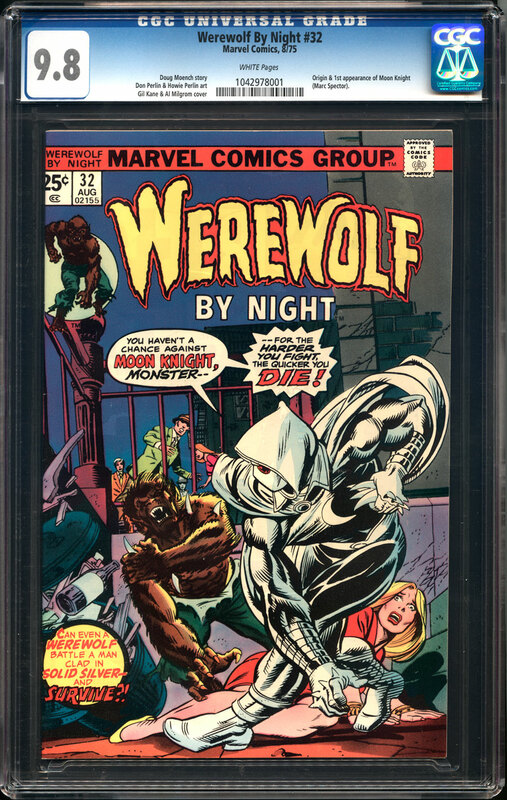 CGC lists Werewolf by Night #32 as the first appearance and "origin" of Moon Knight. After I read this issue, there wasn't an origin story of how Marc Spector became Moon Knight. There was only a panel showing how he got his silver cloaked costume, so I removed "the origin" part from my Key Issue Notes at the top of the page. I don't expect you'll find too many super high grade copies of this comic in the market. As of now, there are 1,270 copies in the CGC census, with only 12 of them being Universal 9.8's and 62 being 9.6's, one being a restored copy. However, there are an abundance of copies between grades of 7.5 and 9.4. These copies make up most of the census. There are 319 copies graded below a 7.5. 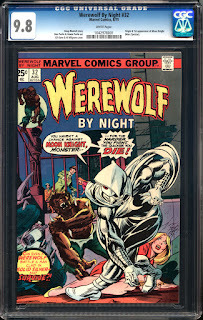 The first appearance of Moon Knight in Werewolf by Night #32 has seen some nice action over the last couple of years, without the help of rumors that he is going to appear on the silver or small screen. I believe that this comic is getting so much love right now is because of speculation, but let's look at some sales. A 9.8 copy sold late in 2015 for an amazing $15,000 at ComicConnect. Unfortunately, I couldn't find anymore sales data for 9.8 copies to compare this sale to. 9.6's seem to be selling steady at around $4,000 range. If you're looking for a slightly more affordable copy, you may need to drop down to the 6.0 - 7.0 range. Right now, 6.0 copies are selling in the $300 range and 7.0's are in the low to mid $500, or you could try to snag a copy in a lower grade than that. It looks as though there is still some investment potential even in 4.0 - 5.0 copies. Which ever grade you decide to get, I wish you luck. I missed out on this one a few years back when it was far more affordable. I hope you don't miss out on it the same way I did.